Oh, I love sheep. 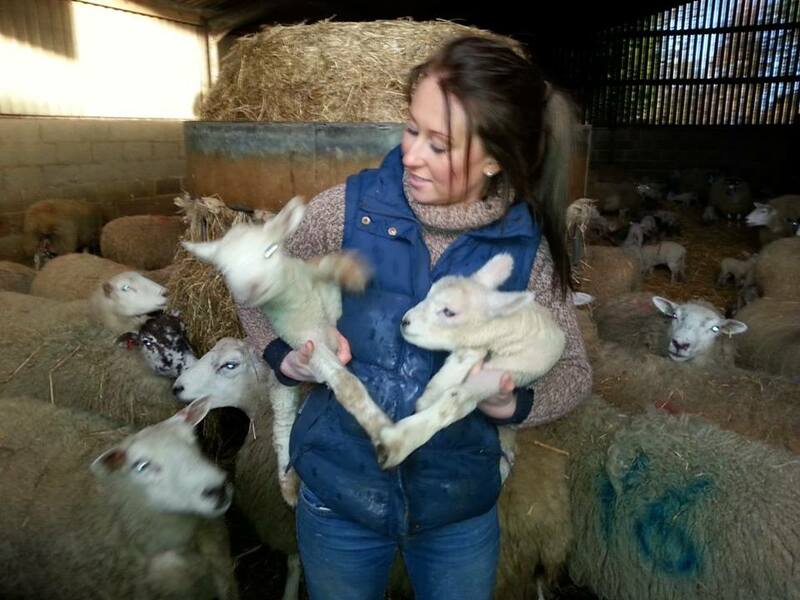 And lambs, and the whole lambing time with all the drama and fight for new life. It’s Thursday in February half-term, and Jess and I are driving to collect Elle. She’s been lambing with GFD (God-father Dave*), and has been unbelievably excited for days. This morning, she woke us up at 6:06 to ask what to do if a lamb comes out dead. We pull her into the warm fug of our bed and tuck her between us, juggling mugs of tea and a William Fiennes. ‘You’ll cope,’ we say, breezily, as if it’s no big deal. We look at each other above her silky head, widen our eyes, grimace. Now, in the car going up to fetch Elle, Jess has her buddy Tightie with us, and both girls are shrieking and bouncing in the back, singing 1Direction with guessed-at words. We pull into Hadsham’s courtyard, and the girls are out before I’ve even turned off the engine. ‘Boots!’ I yell, before they disappear. I climb out of the car more slowly, looking up and around. The grey corrugated walls and roofs of the barns segue into the grey of the sky above. The air is thick with the peremptory bawls of ewes, the anarchic shrills of lambs. I look up at the sky as if checking for rain. Then I look at my car, as if assessing its parking place. Jess and Tightie have gone, vanished into the biggest of the barns. To the casual observer, I look as if I’m just taking my time over pulling on my boots, zipping up my navy anorak. But really I’m nervous. I’ve never left Elle on her own here before, with no other children, and she’s not here to play, she’s here to help, to work with the GFD, Giddyup and Chris, and GFD’s father, Wyck. I hope she’s not been frightened, or felt silly, or been bored (and announced that fact, clearly, in her high, carrying voice). I hope she thinks the whole thing is everything she thought it might be. Ever since she was tiny, Elle’s dreamt of running her own farm, and this is the first time she’s been on the bloody, messy , muck-ooze side of things. Getting stuck in and sweating, rather than watching and messing about on straw bales. I take a deep breath, shake my hair out of my eyes. 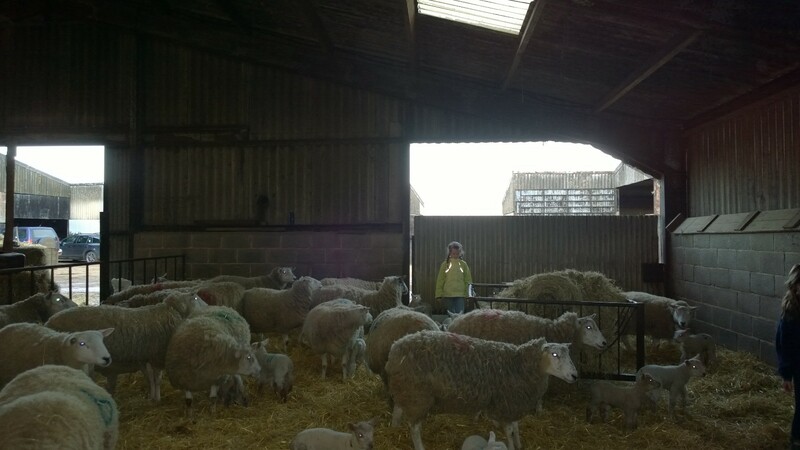 The Lambing Barn is split roughly into thirds. 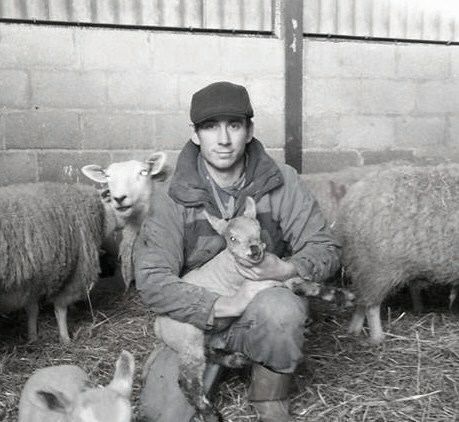 One long third contains panting, swaying ewes in labour, then another third contains the pens for single ewes and their newborns, then the final third is manic, like the worst kind of children’s play centre- a creche – ewes and lambs all in together, making a ginormous racket; lambs rushing around in excitement, ewes barging past each other, stamping. I see my girl as soon as I walk into the big barn, so tall, her yellow anorak too small. Her hair’s springing loose from the long plaits I put in the night before, and her face is very serious. Jess and Tightie have joined her at the hurdles, balancing on a long trough, avid to watch the drama in the corner of the ewes’ pen. GFD is up to his elbow in a sheep, and Chris looks like he’s sitting on its head. The children are open-mouthed, entranced. There’s blood, and brown goo. GiddyUp says yes, just as GFD announces he can’t find the head. Schmallenburg, I think, horrified. But then I remember a conversation with Wyck, who told me about natural immunity, and how unlikely it would be this time round. We watch, our hands over our mouths. GFD withdraws his hand, sits up. ‘Need Dad,’ he says, and GiddyUp and I hurriedly distract the younger children, hustle them off the hurdles and across to the other side of the barn. ‘Oh dear,’ we say. ‘Um…Do you think?’ And we don’t finish our sentences. Jess and Tightie catapult into the raucous creche, intent on cuddling a lamb. Elle follows, slow and steady, scolding her sister for being too loud, pointing and instructing. Imperious. Utterly at home amongst in the deep, yellow straw, one eye on the stamping ewes. Giddyup and I laugh, although I’ve still half an eye behind to my left. Please, please don’t let that be a dead lamb in that ewe. Jess and Tightie are juggling wriggling limbs, Giddyup helping. 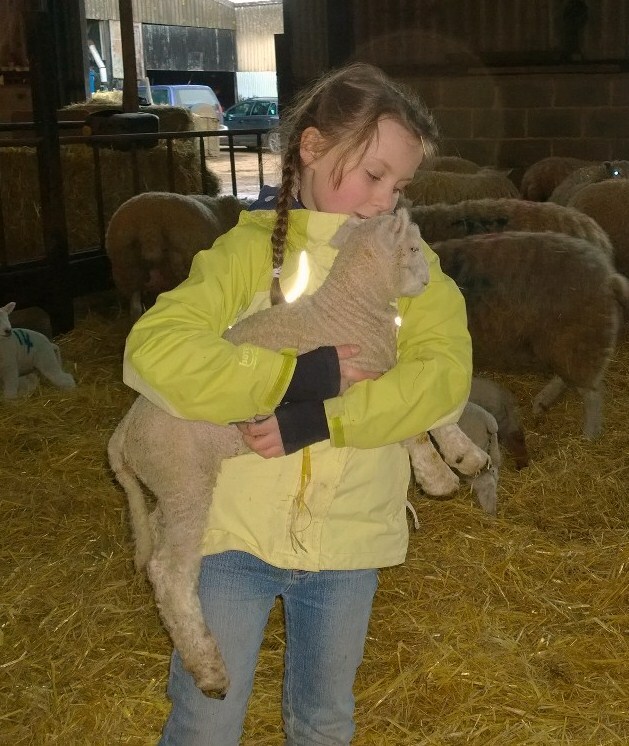 The other two have finally captured a lamb to squeeze, and Elle goes to supervise. I turn, and stand on the lower bar the single-pen hurdles, looking over to where GFD and Chris were wrestling with the ewe. They’ve gone, and my breath catches, ridiculously. Then I see Chris scooting round holding a lamb by its forelegs. Its head hangs horribly, and it’s covered in blood. The next minute, he’s leant over a hurdle, laying the lamb at the feet of a ewe, rubbing at it briefly with a twist of straw. ‘Come on,’ he says. The ewe noses the lamb, then starts stropping it with her tongue. ‘Its head was right back,’ Chris tells me. ‘Tucked on its shoulder.’ He demonstrates and I laugh with relief. Of course it had a head. I tell him about my mum’s goats, and helping them kid. ‘Never had a lamb from a goat,’ he says, and waits for me to get it, grinning at me when I do. ‘There’s another going,’ he tells me, and I follow him back to the labour pen. 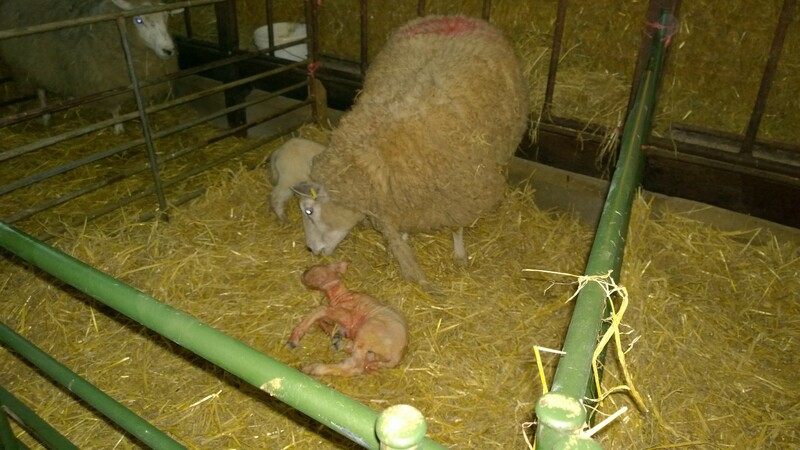 A ewe has had twins, without fuss, and they lay in the straw, wet-looking, but already trying to sit up. 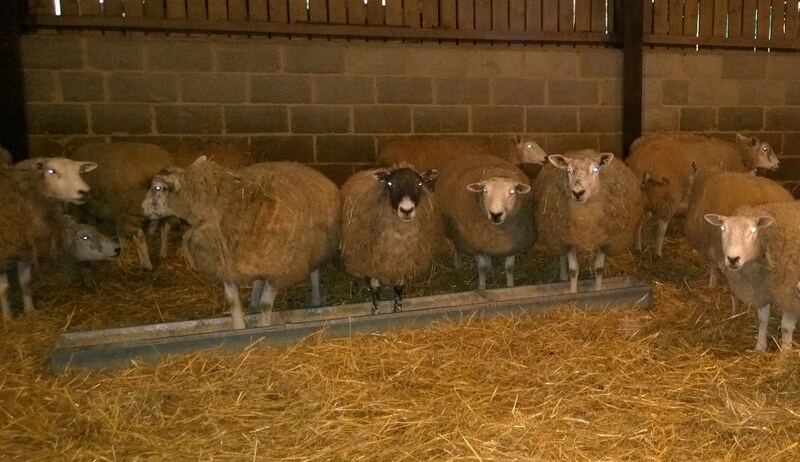 ‘I’ll get the ewe,’ says Chris, and I’m left with the lambs. I try to pick them up the way I’ve seen the others do them, by their two forelegs, above the knuckle, one to each hand. But my grip’s not strong enough, they wriggle and they’re slimily wet and I’m terrified I’ll drop them. I take one at a time, running after Chris, chattering rubbish to the minutes-old lamb. ‘Lambikins,’ I say, laying it next to the ewe in the single pen. I leg it back for the second, anguished at the thought of it alone amongst the panting, pregnant, stamping ewes. 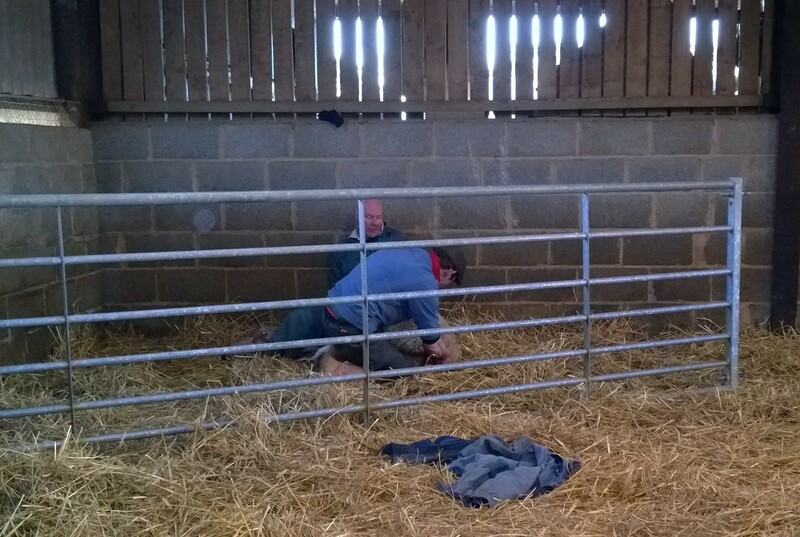 When they’re both in with the ewe, Chris shuts the hurdle and reaches for a spray bottle. Iodine, for their umbilicals and mother’s udder. He checks for colostrum, and then we back away, watching. ‘So incredibly slippery,’ I say, looking at my hands, and Chris takes me to the roll of blue hand towel paper. I wipe and blot, exhilarated by even such a small part to play. There’s a lull now, a re-gathering. GFD is skipping out single pens, carting away the dirty straw, down to the concrete, sprinkling lime, sweeping, filling the barrow. I go back to the first lamb, the one we thought might have died. The ewe’s accepted it and it’s in there with a new sister, bleating on unsteady legs. ‘So cool,’ says a voice beside me. Elle slides her hand through mine. It’s covered in blue-spray paint, her nails rimed black. ‘Oh,’ she sighs. ‘Look, Mummy.’ The lamb’s nosing around, as if to feed. GFD’s in the creche, with Jess and Tightie. ‘Had a good day then?’ I whisper, nudging her with my hip. I put my arm around her, squeeze her close despite her protest. My clever, long-limbed growing-up daughter. Dreams still intact. * We have lots of Daves in our lives. God-father Dave (above), but also Opposite Neighbour Dave, Up-A-Bit Neighbour Dave, Landlord Dave, Cousin Dave and Jack Russell Dave (who really is a Jack Russell). Hence GFD. I loved every minute of that. P.S. we have only one Dave…. up the street Dave and he is a character and a regular stop on our daily walks because ‘Rosey’ lives with him and she’s a white Alsatian with a very deep voice. If we walk past and don’t stop long enough for her to come to the fence she will give us a single bark…… which means come back and say hello. Very cool. Dave also has more stories than Aesop. I love Alsations! We used to have a black long-haired one called the Dark Archer (or Archie, most of the time). Such beautiful, clever dogs. And how brilliant to have an Aesop Dave – what sort of things does he talk about?